Even before the establishment of the World Professional Surfing Circuit the Gold Coast had a World Champion. Peter Drouyn secured the World number one ranking in 1970 with the most consistent performance over a number of international class contests. His most significant victory was in the Makaha Hawaiian Surf Championship. He also placed second in the Duke Kahanamoku Hawaiian Surf Contest and fourth in the Smirnoff Hawaiian Pro-Am. Back home in Australia he was favourite to take out the World Surfing Titles (a one off contest) at Bells Beach but a broken surfboard cost him victory. He was forced to use a smaller board which resulted in him placing third. At the time the ratings were decided by a poll of a leading international panel of surfing experts. Peter was unanimously voted the world number one. It was just five years earlier in 1965, Peter headed to Manly to compete in his first Australian Junior Championship. To New South Wales competitors it was unthinkable that a Queenslander might succeed. In an act of thuggery he was assaulted the night before the contest receiving cuts requiring stitching, and bruises all over his body, but that wasn't going to stop him from competing. He visited a number of doctors and finally received a medical clearance in time to enter and win his first junior championship. He backed up the following year with a second junior crown. Peter Drouyn led the charge for future Queenslanders attempting to overcome the New South Wales dominance of Australian surfing. His debut in the open ranks proved successful when he placed second in the National Championship in 1967. But in 1969 controversy raised its ugly head at the National Championship when Peter and former world champion Nat Young ended their rounds on the same points. This meant a grand final of the top six had to be surfed off to decide a winner. Peter won convincingly, but amazingly the title was given to Nat Young after predominantly southern officials said Young had surfed more consistently in earlier rounds! 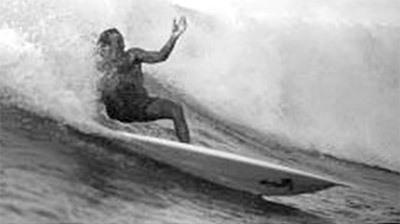 He won the Australian Open Surfing title in 1970 and his world number one ranking that year led him to being named Gold Coast Sportsman of the Year and the Walter Lindrum Queensland Sportsman of the Year. Peter placed second in the Australian Open Championship in 1971 and in the following year pursued his acting career after being accepted into the National Institute of Dramatic Art in Sydney. This later led to him playing a lead role in the movie "The Odd Angry Shot" and he went on to make many surfing movies including his own self titled picture "Drouyn the Movie". In a bid to help promote the movie Peter became the first and only high profile surfer to star in Cleo magazine as a centrefold. In 1977 the Inaugural World Professional Surfing Circuit was launched at the Stubbies Classic at Burleigh Heads which was founded by Peter. It was at this contest that he created the new judging format known as 'Man on Man' surfing, used to decide today's champions on the World Championship Tour. In 1985 Peter introduced surfing to the Peoples Republic of China. Peter is still actively surfing.